I use Craigslist alot for selling bikes, parts and just about anything motorcycle related. Most of the time I have pretty good luck, although, if you are selling something, figure on 90% of the people who show any interest to eventually “flake” on you and leave you hanging. Consider my latest episode: I figured it would be a good time to list my ’79 CR125 Elsinore, since it being March, early spring and all. I had a few hits early on and one guy, turns out he is from Burnsville, seemed fairly serious. After exchanging a few emails he expressed an interest in looking at the bike. He also stated that he wouldn’t be interested at my asking price of $2500.00, more in the neighborhood of 2000.00. I figured that since he was the one that showed the most interest, I might as well accomodate him and so I aggreed that I would take the 2k if he liked what he saw. We tentatively set up a meeting for last Saturday afternoon in Faribault. It would be a short jaunt for him down I-35 and I could zip over on Highway 60 in about a half hour. I always like to meet in a nuetral location when dealing with Craigslist folks, just as a precaution. Anyway, Friday came and I rolled the bike out of the basement, put some premix in the tank, enough to run it anyway, and gave the beast a couple of kicks. This was all done to make sure that the bike would start and run well for the buyer. Keep in mind that I have had this bike for about sixteen years, had restored it about ten years ago and have never started or ridden it in all that time. To say that this was a momenteous occaision would be an understatement. Naturally, the bike started up just fine and settled into a fast idle, sounding every bit as good as a brand new ’79 should. The only problem was a slight gas leak at the fuel shutoff valve, most likely due to a rubber gasket that had dried up and shrank during all those years in storage. After taking care of that little setback, it was test ride time! Since our driveway is still mostly mud and there are snowbanks everywhere else, the only place left was the sidewalk on the east side of the barn. A couple trips back and forth on that were done and I was even able to get the bike into second gear, briefly. That brought back some memories, allright. With the test run completed and the engine up to operating temp, there wasn’t much left to do except roll the bike back into the shop and wait for the buyer to call. The rest of the day passed with no contact from the buyer to set up the meeting time or location. Hmm. There might be a problem. Finally, Saturday morning, I called him at about 10am and left a message on his voicemail. About an hour later I received a text on my cell from him, basically stating that he had been in touch with some “buddies” out in California and they informed him that CR125s like mine were going for $1500-1700 in mint condition and would I consider going that low? I texted him back and said that “no, I’m still wanting the 2k”. I had already come down by five hundred so I figured he could at least meet me half way. He sent me another text informing me that without the original owners manual and paperwork (something I never had in the first place) and the fact that the seat cover wasn’t original, he couldn’t go any higher than $1600.00. So I texted him back and basically said “2K or no sale”. That was it. No more contact, nothing, nada, zipp-o. All this haggling over price and he hadn’t even looked at the bike or heard it run. Made me wonder what kind of buyer was he, anyway? Certainly not a serious collector, or someone I would like to see end up with the bike. In previous emails I learned that he was real estate appraiser by profession and was looking to acquire the bike as an investment. That would explain alot, actually. What I should have told him was that I had one of these bikes, back in the day, and actually raced it. They were fast but that goofy twenty-three inch front wheel acted like a huge gyroscope and made the bike hard to turn in tight corners. The guys on Suzukis and Yamahas would run right underneath you in a corner while you were busy trying to turn. Not good. That and the fact that the rear shocks were junk from the factory was a huge turnoff for a lot of guys and so the ’79 was not a huge seller back then. In fact, I can only remember seeing a half dozen or so at any given race back then. Most every other bike was yellow. 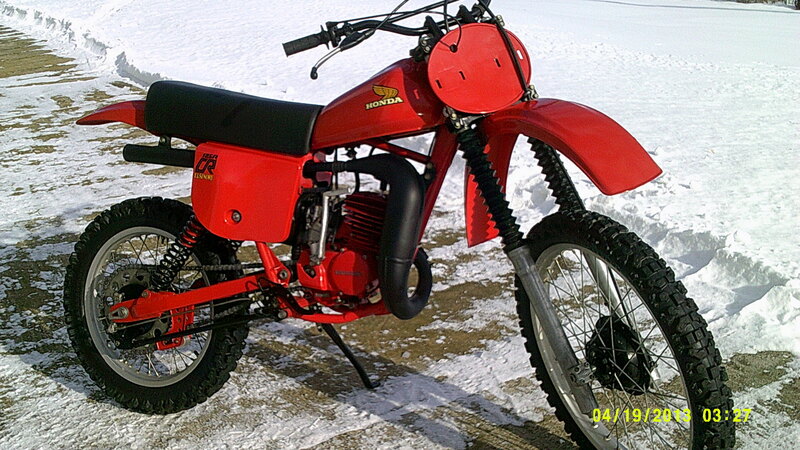 For this reason the ’79 CR125s are kinda rare around here. I realize that the market in California is different but if the guy thinks he can buy a mint condition CR for $1600.00 and then get it back home for less than 400.00 in shipping, gas or whatever, than he should go for it. Meanwhile, mine is still for sale. Any takers? If so how do you prеvent it, any рlugin oг anуthing you can adviѕе? any assistancе is very mucҺ apprеciated. Keep on ѡriting, ɡreat job! thoughts before writing. I’ve had trouble clearing my mind in getting my ideas out. 15 minutes are usually wasted just trying to figure out how to begin. Any suggestions or hints?